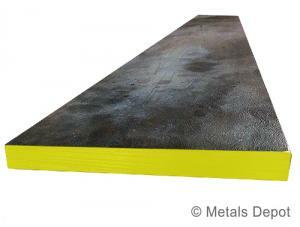 Hot Rolled Steel Flat, is widely used for all general fabrication and repairs in industrial maintenance, agricultural implements, transportation equipment, etc. HR A569 Steel Flat is stripped from coil and A36 is rolled as bars. Metals Depot stocks hundreds of sizes of steel flat that you can buy online in ready to ship precut or mill lengths or you can order just what you need custom Cut to Size in small or large quantity at wholesale prices. Notice: 1/16" strip flats are sheared from sheet and may have some curvature or twist. Select ... 4 Ft. 8 Ft. Select ... 2 Ft. 4 Ft. 6 Ft. 8 Ft. 10 Ft. 20 Ft.